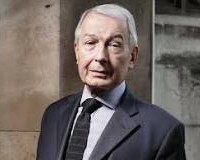 Due to the continuing debate about the Brexit Bill the Crichton Conversation with Frank Field MP, due to be held on Thursday 14th December 2017, has been postponed. This Conversation will now be held on Monday 12th February 2018 at 7.30pm in Easterbrook Hall. If you have already booked for the event on 14th December please contact the Foundation on 01387 702048 to arrange a refund or to transfer your booking to February. Frank Field is a regular visitor to the region and has long watched with interest and encouragement the development of Crichton University Campus. Elected as MP for Birkenhead in 1979, he is considered something of a national treasure because of his relentless campaign against poverty throughout his career. He studied Economics at the University of Hull and in his youth was a member of the Conservative Party but left because of his opposition to Apartheid in South Africa. A long term member of the Labour Party he became spokesman on Education in 1980, on Health and Social Security in 1983, Chairman of the Social Sciences Select Committee and in 1997 Minister for Welfare Reform. In June 2015 he was appointed Chairman of the Work and Pension Select Committee and has hit the headlines recently in challenging Sir Philip Green on the BHS saga. Frank will talk about the barriers creating poverty in particular relating to young people.